In an impressive mouse study, it was shown that in animals that were exposed to high doses of radiation during a 35-week program, those that were fed a pre-radiation dose of tomato powder or tangerine powder had a higher level of the antioxidant lycopene than mice who were not fed the powders (control group). Lycopene is a potent antioxidant found in tomatoes, tangerines, watermelon and other fruits and vegetables. Interestingly, the animals that consumed the tangerine powder had higher levels of lycopene than those consuming the tomato powder, but the results were not as impressive. The number of cancerous tumors that developed in the tomato-fed mice was about half the number that developed in the control group. Tomatoes obviously have anti-skin cancer attributes, but remember that lycopene may not be as effective as the whole tomato powder in reducing that disease. Whole foods are nearly always superior to the nutrients extracted from them, as all of the nutrients work in concert to help health whether for mice or men. There may be hundreds of nutrients besides lycopene in tomatoes, all having a positive effect in protecting against cancer. Why just take one nutrient from the tomato and put it in a pill? I’ll tell you why: It is a way to make money. In this case, the researchers discovered that important substances called glycoalkaloids were significantly higher in the skin after the ingestion of tomato powder, and seem to believe that these substances were responsible for the reduced risk of skin cancer. 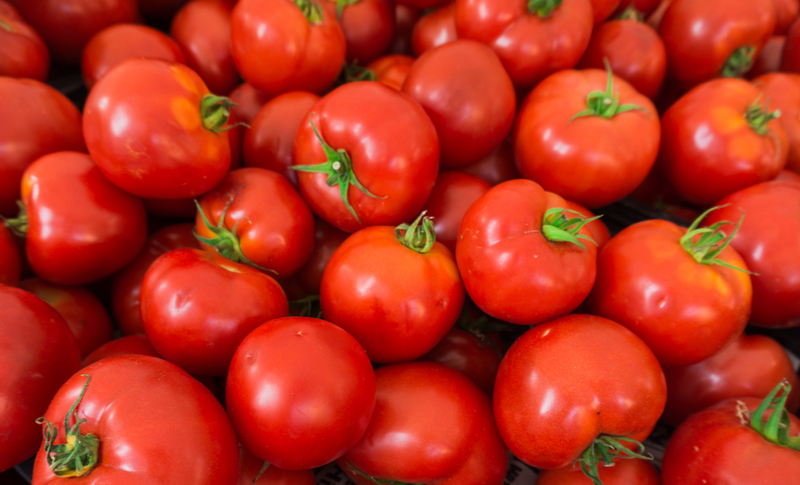 It has actually been known for some time that some of the best skin protectants are tomatoes. One investigation showed that among individuals who consumed forty grams of tomato paste daily for ten weeks, sunburn-resistance time increased by 40%, and other research demonstrated that eating different tomato-based products correlated to significantly reduced risk of sunburn after exposure to ultraviolet radiation from sunlamps. It is also known that individuals with the lowest intake of alpha-carotene, beta-carotene, cryptoxanthin, lutein, and lycopene (all carotenoid antioxidants found in such vegetables such as carrots and tomato) had a 50% increased risk for melanoma. There are few foods that taste better than a ripe, field-grown tomato. Eat your fill and enjoy some regular, non-burning sun. Cooperstone JL, Tober KL, Riedl KM, Teegarden MD, Cichon MJ, Francis DM, Schwartz SJ, Oberyszyn TM. Tomatoes protect against development of UV-induced keratinocyte carcinoma via metabolomic alterations. Sci Rep. 2017 Jul 11;7(1):5106. Stahl W, Heinrich U, Wiseman S, Eichler O, Sies H, Tronnier H. Dietary Tomato Paste Protects against Ultraviolet Light–Induced Erythema in Humans. J Nutr 2001;131:1449-51. Aust O, Stahl W, Sies H, Tronnier H, Heinrich U. Supplementation with tomato-based products increases lycopene, phytofluene, and phytoene levels in human serum and protects against UV-light-induced erythema. Int J Vitam Nutr Res 2005;75:54-60. Afaq F, Katiyar SK. Polyphenols: skin photoprotection and inhibition of photocarcinogenesis.Mini Rev Med Chem. 2011 Dec;11(14):1200-15. Afaq F, Katiyar SK. Skin photoprotection by natural polyphenols: Anti-inflammatory, anti-oxidant and DNA repair mechanisms. Arch Dermatol Res 2010;302:71. Meyskens FL Jr, Farmer PJ, Anton-Culver H. Diet and melanoma in a case-control study. Cancer Epidemiol Biomarkers Prev 2004;13:1042-51. Are Australians waking up to the sunscare fraud? Sunlight and Sunscreen: Good or Bad For You?